The West Pacific States form one of the nine geographic divisions within the United States that are officially recognized by that country's census bureau. 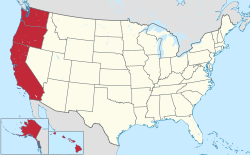 There are five states in this division – Alaska, California, Hawaii, Oregon, Washington – and, as its name suggests, they all have coastlines on the Pacific Ocean (and are the only US states that border that ocean). The Pacific States division is one of two divisions can be found within the United States Census Bureau's Western region; the other Western division is the Mountain States. Despite being slotted into the same region by the Census Bureau, the Pacific, and Mountain divisions are vastly different from one another in many vital respects, most notably in the arena of politics; while nearly all of the Mountain states are regarded as being conservative " red states", four out of five of the Pacific states (all except Alaska) are clearly counted among the liberal " blue states". ^ a b c d Geography, US Census Bureau. "State Area Measurements and Internal Point Coordinates". www.census.gov. ^ https://www.federalregister.gov/documents/2010/09/24/2010-23997/agency-information-collection-activities-proposed-collection-comment-request-underground-storage Federal Register. Agency Information Collection Activities; Proposed Collection; Comment Request. Retrieved 9 January 2018.